What is Erythromycin used for? 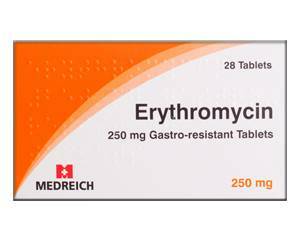 Erythromycin is a type of medicine called a macrolide antibiotic. The active ingredient erythromycin works by preventing bacteria from producing proteins that are essential to them. Without these proteins the bacteria cannot grow, replicate and increase in numbers. This treats the bacterial infection. Erythromycin is a prescription-only medicine. Erythromycin is prescribed as a course to treat a wide variety of bacterial infections, including respiratory infections (pneumonia, acute bronchitis, sinus infection, Legionnaires' disease), STDs such as chlamydia and gonorrhoea, and skin infections such as acne, boils and rosacea, a condition where red patches appear on the cheeks and nose, sometimes accompanied by bumps, spots and veins that are visible in the skin as red lines. Erythromycin is available in tablet or granule form. Erythromycin tablets should be taken with water, preferably on an empty stomach one hour before or two hours after food. Erythromycin granules should be dissolved before drinking. Empty the contents of one sachet in half a glass of water, stir well and drink the mixture right away. Unlike the tablets, the granules should be taken with or directly after meals. Make sure you finish the entire course. Stopping early could cause the infection to return. Erythromycin is usually prescribed as a one to two-week course. Conditions such as rosacea may require longer treatment. Adults and children aged 15 and above: 2 to 4 grams a day spread out over the day. The doctor may prescribe an alternative dose for other conditions and children. Always follow the prescription exactly - never take more or less than the doctor recommends. Read the package leaflet closely before use. You have a severe liver condition. Erythromycin may interact with other medicines. Therefore, it is important to tell the doctor what medicines or nutritional supplements you are currently taking. The doctor will have a list of medicines that you should avoid mixing it with. You should also consult the doctor on the use of Erythromycin if you have health problems. With your doctor's approval, Erythromycin can be used during pregnancy and while breastfeeding. Erythromycin does not, in principle, affect your reaction time. In the unlikely event that you do feel dizzy or sleepy, you should avoid driving. Erythromycin does not interact with alcohol.